There are actually two different deployments to Europe right now. One — the deployment of the 3rd Brigade of the 4th Infantry Division in Poland — is part of Operation Atlantic Resolve and is a U.S-Poland bilateral agreement. The second is part of NATO’s enhanced forward presence in the East. The United States will lead a battalion-sized unit in Poland with other NATO nations contributing troops and capabilities to the unit. Canada, Great Britain and Germany will lead similar mixed units in Latvia, Estonia and Lithuania. The enhanced forward presence — which NATO leaders agreed to at the Warsaw summit — is important because it shows that all members security concerns are being addressed by the alliance, the chairman said. “That’s what makes the alliance relevant: each of the nations must feel that the alliance is meeting their security challenges,” Dunford said. 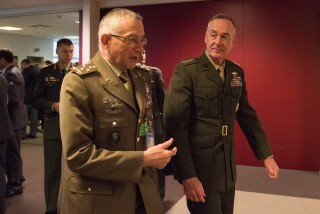 NATO can do and is doing more in dealing with the challenge of countering violent extremism, Dunford said. Its unique role is in defence capacity building, the general said. He cited the alliance’s Mediterranean Dialogue as an example of the capacity building that enhances stability for all. NATO works with Jordan, Egypt, Algeria, Israel, Tunisia, Mauretania and Morocco to build security capabilities and enhance the environment for economic development.